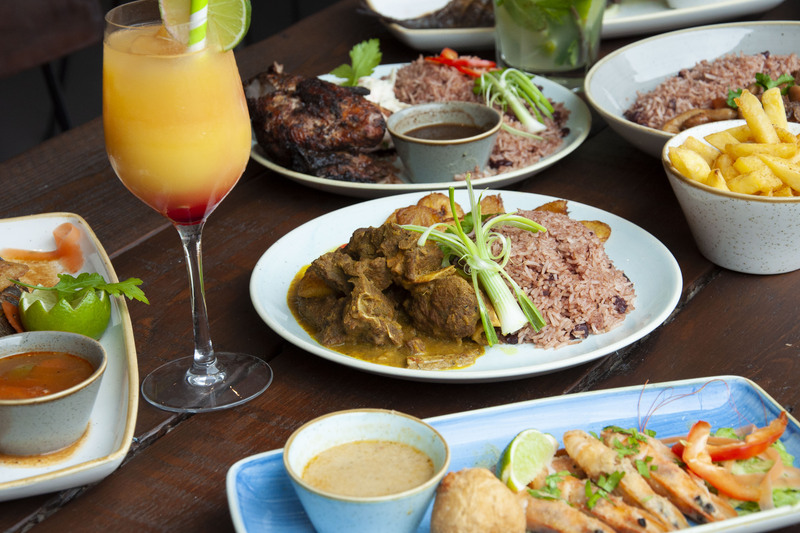 If you want to enjoy authentic Caribbean food without feeling like you’re in some over-the-top Club Tropicana themed music video and enjoy your jerk chicken in a relaxed, chilled environment then Rhythm Kitchen is just the tonic, or rather rum, for you. This understated Walthamstow eatery has only been open for a handful of months but has already garnered a following of loyal customers thanks to its bona fide array of delicious dishes. The decor is understated chic, with pastel walls illustrated by black and white prints of retro dancehall scenes and finessed with subtle reggae beats. Upon arrival on a quiet Sunday evening, smiling staff are quick to seat us and proffer the extensive cocktail menu for our perusal. Rum is a national treasure in the Caribbean and Rhythm Kitchen takes the spirit very seriously, with over 60 different types on offer, and imaginative, generously sized concoctions, costing a reasonable £7.50 each – our favourites were the thirst quenching Jamaica The Italian Krazy, with Disaronno, lime, mint and lemon juice, and the rather oppressively titled Zombie, with three different kinds of rum, apricot brandy and grenadine. It’s worth noting that there is a happy hour during the week from Monday to Thursday between 5pm and 7pm, should you fancy a cheeky tipple after work. Pleasantly, the food portions here are generous – a rarity for the capital – so don’t go too mad on the starters. 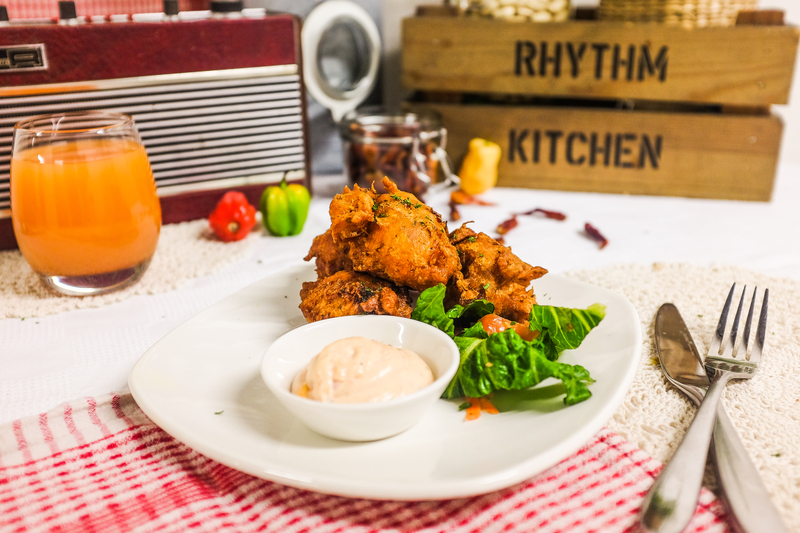 We tucked into Caribbean favourite Saltfish fritters, dolloped in moreish sweet chill mayo, and succulent coconut peppered prawns – served with mini dumplings. Mains are a vast variety of everything you could imagine from the region, including curry goat, jerk chicken seasoned in a homemade marinade and slow cooked oxtail in a rich sauce. I feasted on jerked whole fish of the day, which comes grilled, steamed or fried with a host of sides including Jamaican special hard food (boiled dumpling, banana and yam) yummy fried plantain and Mac and cheese. Everything was cooked with care and seasoned to perfection, with sides and dressings well thought out. Despite not having nearly enough room for dessert we were led astray by the sweet choices, including traditional apple crumble, banana blondie cakes and coconut ice-cream. The sister restaurant of original Stratford Westfield venue has always been the dream of owner Delroy Dixon AKA The Jerkfather, who grew up down the road. He was kind enough to pop in during our visit to tell us all about his passion over a digestif of warm rum. Rhythm Kitchen offers a heartfelt taste of Jamaica at affordable prices, Delroy’s got the recipe just right.